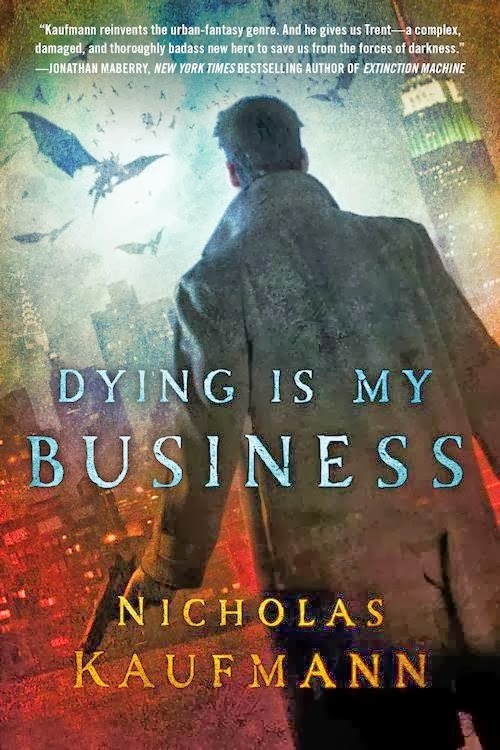 If you like the Harry Dresden series or any of the numerous other urban fantasies about modern day magic then you really ought to get this book. I bought it when I was looking for something else. When I finally started to read it I didn't want to put it down. I think I finished it in two days. I'm sure it wasn't more than three. So I can't really give it higher praise than that. I think this is first in a series. Trent is a "collector" for a Brooklyn, NY crime boss named Underwood. By collector I don't mean he collects monetary debts though he's done that in the past. No, Underwood sends Trent out on "special" assignments. Underwood craves information, antique, rare or legendary items, or people who can provide him leads about the first two things I mentioned. Trent usually tries to leave the rough stuff to Underwood's other primary enforcers but this isn't always possible. Underwood could care less if Trent or anyone else gets hurt in the process of collection. Mostly this is because Underwood is sociopathic but it's also because Underwood and his goons know that Trent can't be killed. Any time Trent is killed, he rises again. But the person in closest proximity to Trent dies in his place. Trent feels guilty about this and has actually started keeping a journal of the people who have died in that manner. But his memory doesn't go past a year. He doesn't know his real name or where he's from. Underwood claims to have some of that information and be looking for more. Trent is almost certain that Underwood is lying to him but he's desperate for information and wants to believe Underwood. After Trent delivers a man to Underwood, Underwood assigns Trent to retrieve a very special box that's in someone else's possession. Trent is ordered to bring the unopened box back to Underwood without peeking inside it. And lastly, Underwood wants Trent to kill the people who currently have the box. He is particularly insistent on this last order. Although Underwood can't really kill Trent, as he reminds him he could easily make Trent wish he were dead or refuse to share information he's discovered about Trent's background, which to Trent, would be just as bad as physical torture. Thus properly motivated, Trent sallies forth to do his master's bidding, as he has many times before. This time proves to be different. The box was only temporarily in the possession of the targeted people, a woman named Bethany and a man named Thornton. They've hidden it somewhere else. And then before Trent can find out where he and his new companions are attacked by creatures that Trent previously didn't believe existed. Trent discovers that he has abilities that he didn't know he had. He also learns, though his resurrection abilities should have been evidence enough, that magic is real. Bethany is a sorceress and possibly of Sidhe heritage while Thornton is a werewolf. And they're the good guys. Although they may not know what's in the box Bethany and Thornton are part of an organization tasked to recover and archive items of great magical power, lest they be used by people of evil desires. They (primarily Bethany) have a wary trust for Trent as he came to their aid. Trent decides to work with them for a while. He finds that the world's real history includes magic, dragons, elves, and other supposedly fanciful beings. Trent drifts away from his employer's control. He gains a certain sense of independence and morality. This is not good for Trent's health. Underwood insists that employees follow orders exactly or be severely punished. Underwood has a strange ability to locate errant employees, who usually become late ex-employees. Several competing groups launch a search for the box. Trent's new powers surprise, impress or worry his new found friends. They tell him he does impossible things. To hear that coming from magicians, werewolves, healers, dragons and vampires is something which bothers Trent almost as much as Underwood's ability to track him down. Trent's also struggling internally over whether to betray Bethany and Thornton, who initially think that he randomly found them. The story pacing kept me interested and might keep you excited as well. It's as much a chase story as anything else. It very adroitly balances the supernatural and the noir. This is written in first person. The characters are not as important as the plot. This book moves. It's like driving down the expressway the wrong way at 100 MPH and not hitting anyone...barely. There are only a few info dumps. Given that they're fighting for their lives and more almost through the entire book , Bethany and friends don't have the time or inclination to sit down and explain everything to the flabbergasted Trent. Whether they're asking for help from a dragon who lives under NYC or trying to find a way to kill immortal knights who can shift dimensions the good guys have their hands full every page. I was very impressed and really really hope that there is a sequel. I think I've figured out who Trent really is. I'm curious to see if I'm correct. Nobody gets out of this world alive. Depending on how you look at it that can be a source of relief or horror. 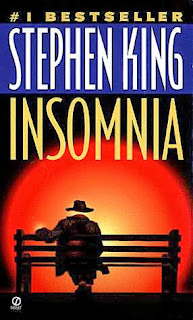 King uses both points of view in his book Insomnia. As I age I find myself unfortunately having to spend more time in and becoming more familiar with hospitals, usually but not always, because of older relatives. When you're walking through hospital lobbies or reading books in waiting rooms you can't help but notice the older and/or sick people, many of whom can't walk, can't talk or have other obvious frailties. It's sobering to realize that if I live long enough, one day that will be me. All of us will trade youthful energy or even middle aged maturity for old aged weakness and eventually death. So you had better enjoy your youth, your health and your independence of action while you still have it because some day you won't. That said, though as the joke goes just because there's snow on the mountain top doesn't mean there's not fire down below. King builds a sympathetic and effective depiction of older heroes and heroines, who may not have the bodies or strength they once had, but make up for it with experience, empathy and wisdom. Age is not always a bad thing even if we too often see its impacts as bad. It helps that there's a lot of humor in the book. King could have cut this story in half and just focused on the pains and irritations of age and loss. It still would have been a great read and something that was non-supernatural horror. But he didn't do that. The everyday horrors of age and physical or mental weakness are mirrored by an subtle and increasing supernatural threat. Insomnia is an older book, which for some strange reason I just recently got around to reading during my all too short holiday break. As I nearly broke my ankle doing something stupid I had plenty of time to lay on the couch and read. 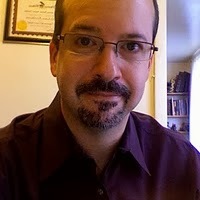 Insomnia has allusions to King's Dark Tower series as well as to The Talisman, which King co-wrote with Peter Straub. It could possibly also have links to It and to Dreamcatcher. These are teased out throughout the book and I didn't pick up on them at first. I'm sure there are other links and references which I missed but will be obvious to other King fans. Parts of this story also reminded me of the Madeleine L'Engle A Wrinkle in Time and Susan Cooper's The Dark Is Rising series. Similar to many King stories this takes place in Maine, the city of Derry to be exact. As usual, King's eye for accents and everyday conversations firmly embed this story in reality, so much so that when the paranormal starts to intrude you are just as surprised and disturbed by this as the protagonists are. Ralph Roberts is a seventy something man who, at the book's start is losing his wife Carolyn, the love of his life, to a brain tumor. Although other brain specialists tell him it's just one of those things and probably nothing could have been done, Ralph can't help but partially blame his wife's primary physician, Dr. Litchfield, for misdiagnosing his wife's headaches. Derry's citizens are also in the middle of an abortion rights brouhaha, as pro-choice activist Susan Day is coming to speak. She is fiercely opposed by Derry's pro-life contingent, who tend to be mostly older people except for a small radical anti-abortion splinter cell led by a young man named Ed Deepneau. Deepneau is Ralph's neighbor. He's formerly someone the genially and generally pro-choice Ralph considered a friend. That is until Ed went off the deep end and brutally assaulted his wife. This action, combined with some odd, really insane, things that Ed told Ralph, makes Ralph quite wary of Ed. After Carolyn dies, Ralph suffers really bad insomnia. He can't sleep. Ralph wakes up earlier and earlier each night until he's running on 2-3 hours of sleep. And then he starts to see things, things that if he told anyone about would likely get him involuntarily committed. But these things appear to be real. And some of the entities that Ralph sees also see him. Reality and hyperreality start to merge in an adult Alice in Wonderland sort of way. And what's seen can't be unseen. What's done can't be undone. Ralph and his friend Lois, who is the only other person who has his visions, are pulled into an eternal battle fought in a number of different planes of existence. This book is almost 700 pages. I thought the build up might have moved a little more quickly. 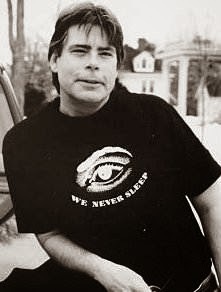 But even a verbose Stephen King, is well, still Stephen King. Good stuff and if you haven't read it already I think it's worthwhile. Of course I'm biased as King has always been a favorite. Like few other popular writers King remains unflinching in his ability to describe the good and bad in humans. Whether it's the sudden flash of resentment we feel towards someone who cuts us off on the road, the fierce love we have for family and intimates or the suspicion we have towards those unlike us, King captures these emotions in a quite realistic way. I think I know where King, the real man, stands on abortion rights and gun control. Doubtless some who disagree with his stances might not like certain depictions in Insomnia. But it's fair to say that King the author fairly and occasionally gleefully illuminates inconsistencies and failings in both the pro-choice and pro-life positions. His characters are messy, just like real life. Being Mary Jane & Scandal: Where are the Wives? Would Dr. King Have Supported Twerking? I Said Stop Texting During The Movie!! !